The Sunday Carnaval parade in Independencia assaults the senses with swirling colors, a cacophony of sound from the shrill music and flares, and the reek of gallons of chicha offered to the Pachamama (Earth Mother) by being tossed on the ground before imbibing. The 6th sense must remain wary because if one becomes mesmerized by the spectacle the impact of a water balloon and the accompanying chill wetting comes as quite a shock. 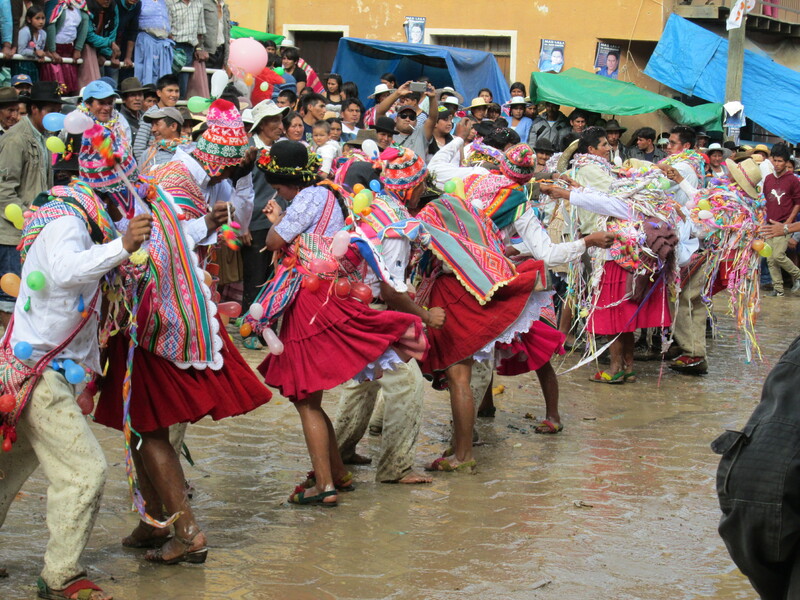 Members of the rural communities compete in the parade for the prestige and the prize money awarded for best traditional music, dance, and dress. 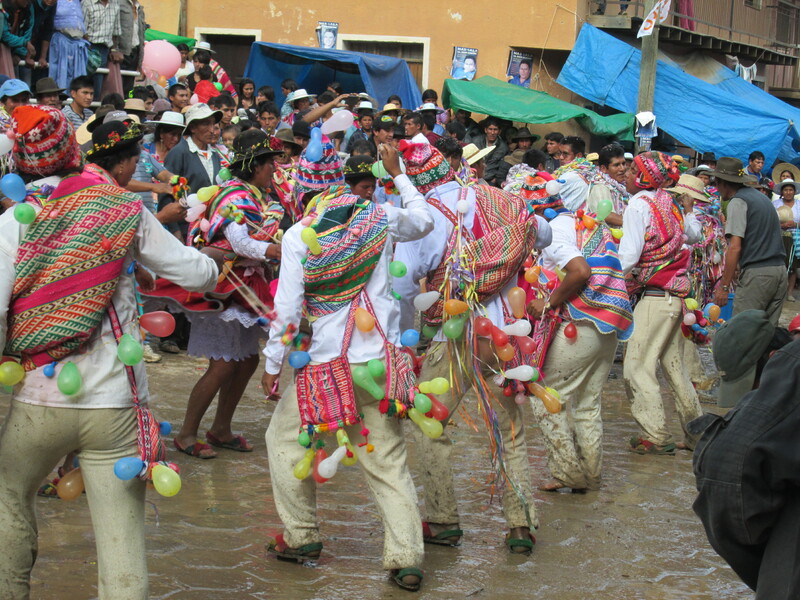 Each community of musicians and dancers queues up behind their mayor and his family who are adorned with streamers and balloons in preparation to dance into the plaza for the judging. The mayor is identifiable by the tin staff of office he carries. Chicha bearers accompany each group laden with plastic buckets of the fermented corn beverage. 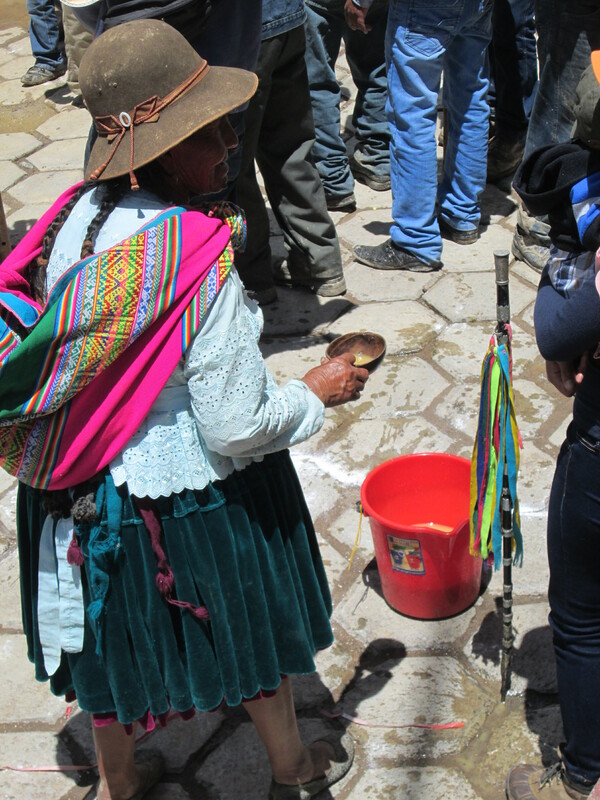 The municipality authorities and judges sit in front of city hall from where they are offered a scoop of chicha by the mayor’s family then grabbed by the hand to join in a circle dance with the mayor’s entourage. The musicians stage themselves in a circle at the center edge of the plaza playing intently on homemade wind instruments, tin penny whistles and drums. The female dancers in swirling red or blue bayeta (woven wool) polleras (skirts) and male dancers in bayeta pants weave in 2 lines back and forth through the plaza with stoic expressions ignoring the water balloons and flying water tossed from buckets refilled in the plaza’s fountain. By late afternoon the growing mud in the plaza makes for slippery footing. 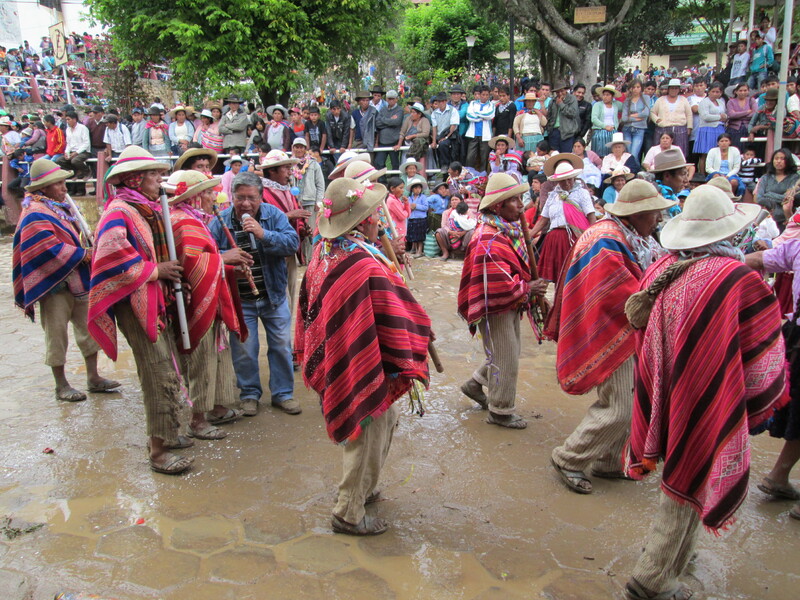 As each group dances out of the plaza to make way for the next community they find space nearby to continue dancing increasing the sound, color, and motion. It’s quite the street party. 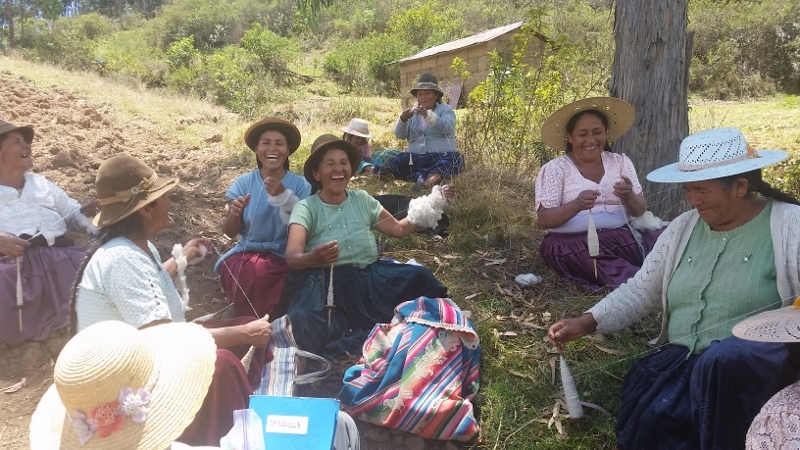 The Carnaval parade is a grand opportunity to see finely woven textiles, but they are becoming more mixed with the cheap factory made ones that are becoming more prevalent for everyday use. The barrage of water balloons died off noticeably between the parade and the next morning’s peach slinging contest. Rural men and women carry a braided sling tucked in their waistband when they head out to field or pasture. Once a year they can demonstrate their sling prowess in Carnaval’s warakanaku competition. 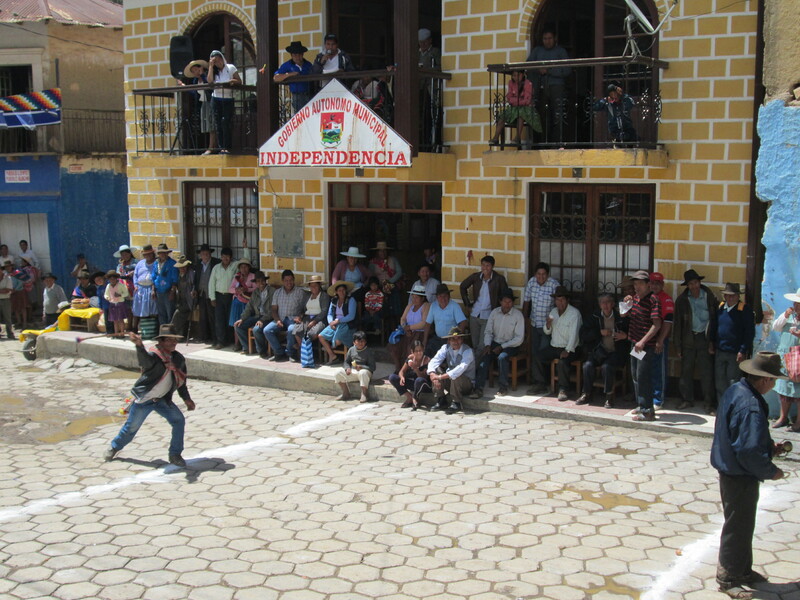 Two lines are chalked on the plaza cobblestones in front of city hall and a pair of competitors face off using a peach as their sling’s ammunition. One competitor turns his/her back as a target while the opponent aims a peach. 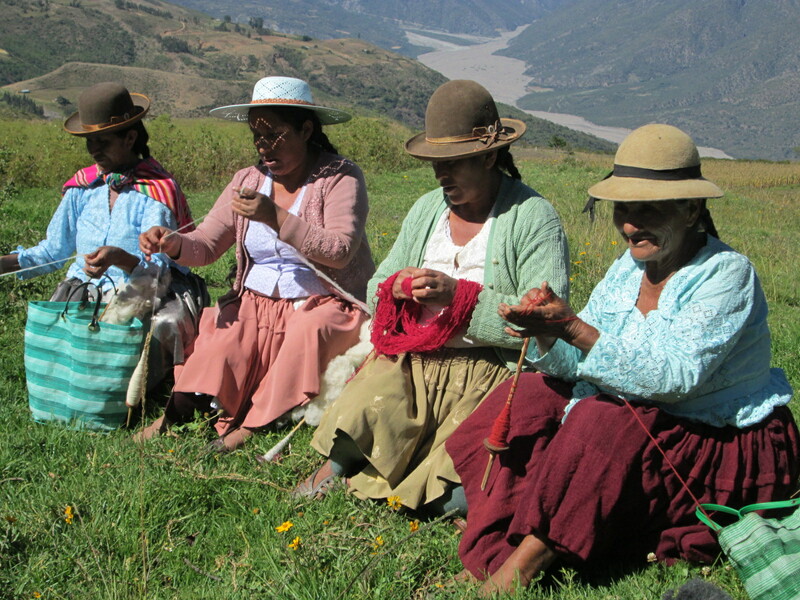 females were in jeans or lightweight synthetic everyday polleras. Tuesday is the day homes are decorated, feasts are prepared in wood burning ovens, and families ch’allah, which is a ritual asking and receiving blessings from the Pachamama. 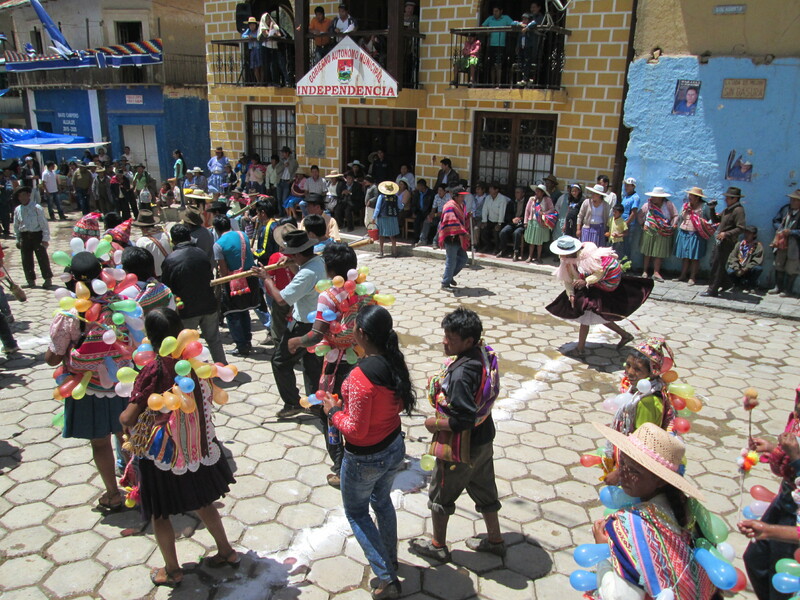 The Sunday following the parade ends Carnaval week with a singing competition in Quechua judged on wit and humor.